We all had a great time, despite some rain. Good visibility as we were on a busy street - some EV drivers pulled in to see what what going on and to connect with other drivers. There was a lot of time spent huddled under a canopy - which produced some sparkling conversation about electrified driving. Even with Mother Nature throwing us a curve, the attendees were very hardy, and I thank them for stopping by! 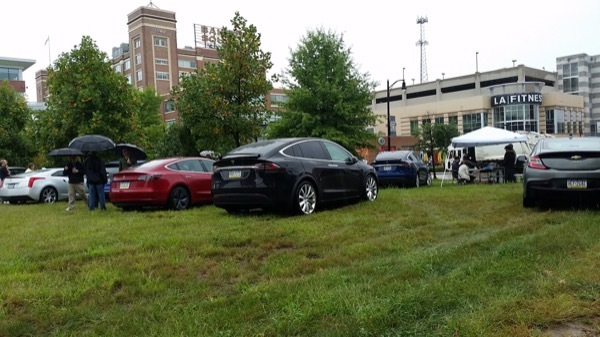 This is the 5th year of Pittsburgh hosting National Drive Electric Week, and this year promises to be bigger and better. It's free and open to the public! There will be battery electric and plug-in hybrid electric vehicles from owners and local dealerships for you to check out and go for a test drive. (This is an education and outreach event for the public, and NOT a sales presentation.) Hope to see you on Electric Avenue! This year's event will be held at Bakery Square! If you have an electric car, there are 12 ChargePoint charging stations in the garage. It's free to charge and park (for 3 hours) but you will need a ChargePoint card or the ChargePoint mobile app to activate your charging session. Registered attendees report 411,429 electric miles driven.